This post is particularly odd to write. I feel an odd mix of emotions - joy, relief, nervousness, maybe even a tiny bit of guilt. Some of you will be happy for me, some of you will be sad for me. Who knows, maybe some of you won't ever speak to me again. But here it is, like a turd on a table. So I was born Mormon, just like a good portion of you reading this. Throughout my life, I had various levels of interest in being religious. I was quite adamant about it through my youth. I attended church somewhat regularly through my teen years, although I wasn't as into it as I was in the prior years. When I moved out on my own, I started attending the local church to start meeting people. I went along with the religion thing, but I wasn't really convinced of the truth of it. I did this for several years. During this time, I went through several relationships, most of which failed for religious reasons ... either I wasn't religious enough, or I was too religious. Basically I was a fence sitter. Finally around age 25, I felt I needed to make a decision and choose a side of the fence. I read a lot. I talked to a lot of people. I prayed a lot. I finally decided that Mormonism (and religion in general) wasn't for me. I stopped going to church and never really looked back, and I felt fine about it. I never officially resigned from the church because I felt it didn't matter - I'm just a name on a list somewhere of no significance. That all changed last year with the Prop 8 debacle. The leadership of the church had taken vaguely neutral stances (at a political level) in the past, but this one was very polarizing. It was at this point that I realized I no longer wanted to be associated with an organization that espoused these views. I felt dirty that I was even listed among them. I sat for a few months thinking it over, but my feelings of disgust never subsided. It was time to formally resign. I filled out a generic resignation letter and sent it in. They processed it quickly and without any harassment to reconsider. 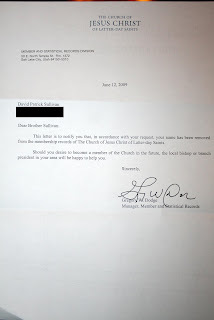 So as of June 15, 2009, I am no longer Mormon. I feel relief to no longer be associated with an organization that I feel openly persecutes, and uses questionable rationale to justify themselves. What better way to wrap up a trip to Hong Kong than a visit to the Peak Tower on Victoria Peak? A few more photos can be found here. Cheung Chau Island is a small island a bit southwest of Hong Kong proper. It's quite interesting to walk around - it doesn't have as much modern infrastructure as Hong Kong which gives it personality. We spent the second day walking the island and seeing the sights. The complete set can be found here. The first day in Hong Kong was very rainy. They get some pretty intense rainstorms with some very impressive lightning. We took the subway to the outskirts of town by the airport, then hopped on a bus for a very hilly drive to the Tian Tan Buddha. Unfortunately the rain did not lend to great photographs. You go to Phuket to sit on a beach, or island hop, or to be accosted by people trying to sell you fake designer clothing and cheap suits, or to get a massage on the beach for $3. Oddly enough, on my flight from Singapore to Phuket, there were about 40 other people from Salt Lake City. They were all there for some humanitarian work, although I'm not sure specifically what. Nothing says 'happiness' than drinking a drink out of a fresh coconut. Street vendors were selling these fish stuffed with all sorts of spices. I was a bit hesitant about eating fish from a street vendor, but it proved to be one of the tastiest meals I had on the entire trip! When in Thailand, you should take the opportunity to ride an elephant. It works best if you're incredibly white and are decked out in all sorts of knock-off designer clothing. Electrical safety seems to be somewhat optional in Thailand. We did a bit of island hopping on the second day. PRO TIP: Don't hop multiple islands in one day. It ends up being extremely touristy and you have a very short amount of time to enjoy yourself. Limit yourself to one or two islands for the day! Complete Phuket sets can be found here and here. Pulau Ubin is a small island off the east coast of Singapore. My friend Shelley and I rented a bicycle for the day for $1.50 and biked the island. We stopped for a lunch of crab and shrimp in broth. I also tried a durian, which is an extremely sharp and smelly fruit that they love over there for some reason. I didn't think it was horrible, but I probably wouldn't go out of my way to eat it. The rest of the Pulau Ubin photos can be found here.